New science from fish biologists demonstrates what common sense already tells us: fish, like all animals, feel pain and can suffer much like our beloved dogs and cats at home. 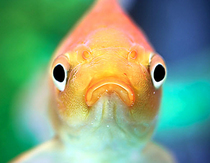 Unfortunately, since many people find it difficult to empathize with fish, their suffering often goes unnoticed. Current findings confirm that fish are more complex that we've ever imagined. Nevertheless, horrific cruelty to fish, such as suffocation and dismembering alive, is common industry practice. Although anglers and sport fishermen claim that fish lack feelings in order to justify impaling fish on hooks, violently pulling them from water and mercilessly suffocating them, a series of behavior tests have shown that instead of a merely reflexive response to pain, fish possess a conscious awareness of pain. Experts believe that fish are not only capable of feeling pain, but also pleasure - oxytocin, a "feel-good" hormone, has been discovered in fish. Fishing proponents fear this latest research will result in new restrictions on fishing, as they've already seen tournament fishing banned in Germany. This current science could certainly influence how consumers look at fish. As the popularity of eating fish for purported health reasons grows, so does industrial fish farming. Victoria Braithewaite, Professor of Fisheries and Biology at Pennsylvania State University, predicts that in the next few decades, almost half the fish consumed will come from fish farms, leading her to conclude that "if we care about chickens and pigs in the industrial production of food, we should also care about fish." As consumers, we have the power to spare fish - and all other animals used in food production - unnecessary pain and suffering by making the compassionate choice to forgo fish and all meat, dairy and eggs. Visit ChooseVeg.com to learn more.